Arizona Welcomed Medicaid Expansion, Now Fears Losing Out Under GOP Plan : Shots - Health News The state expanded Medicaid under a Republican governor a few years ago, extending health coverage to hundreds of thousands of Arizonans. But the GOP plan in Congress would cut much of that funding. "I like that we can choose our own doctors," says the 60-year-old resident of Mesa, Ariz. "They also have extensive mental health coverage." Dotts isn't on some pricey plan, either. She's among the nearly 2 million people enrolled in Medicaid in Arizona and one of the more than 400,000 who have signed up since the Republican-led state expanded Medicaid in 2013. Her eight prescription drugs are cheap, Dotts says, and she has no copays or premiums. The Medicaid benefits have allowed her to stay on top of her emphysema, depression and osteoarthritis. "I have torn ligaments in my ankles and I can't take the time off work to go to physical therapy or surgery," she says. So she's grateful to be able to manage her other conditions. Dotts works retail and lives paycheck to paycheck. Without Medicaid, she says, she wouldn't be able to afford to see a doctor. "It's just barely above what they consider livable income. Any extensive medical issues would put an excessive burden on me," she says. She wouldn't be eligible for Medicaid, except that Arizona started accepting extra funding from the federal government via the Affordable Care Act in 2014 to raise the income threshold for Medicaid in the state. That enabled Arizona to expand Medicaid to cover more people. The replacement plan the GOP leaders in Congress have proposed would cut off the federal funding for that sort of expanded eligibility after 2020. Swapna Reddy, a professor at Arizona State University's School for the Science of Health Care Delivery, says as Congress overhauls the health care law, a state like Arizona might particularly suffer. Unlike some states that expanded Medicaid, Arizona saw a rush of people joining the rolls, Reddy says, because it had a "high-need, uninsured" population. The Republican bill would continue to pay the higher federal rates that the ACA's Medicaid expansion offered people like Dotts, Reddy says — but only if they're already enrolled in Medicaid, and their personal income stays about the same. "What we know about the Medicaid population is that they kind of fall in and out of eligibility on a regular basis," she says, because the amount of money they earn tends to fluctuate. "So it has the real potential of eradicating Medicaid expansion over a period of time," Reddy says. The states and the federal government share the cost of Medicaid. Instead of an open-ended entitlement, the bill making its way through Congress right now would cap the federal government's contribution. But putting a fixed limit on the federal government's contribution is unlikely to allow Arizona Medicaid to keep up with the growing cost of covering people, Reddy says. "The states will have to come up with the remaining money to cover these folks," she says. The Republican health plan would eventually cost Arizona nearly half a billion dollars a year, according to calculations by the state, just to keep the adults with the lowest income in the expansion population insured. It's a group that Arizona voters actually required the state to cover in 2000 through a ballot initiative. But during the recession in later years, financial pressure led state lawmakers to freeze enrollment for those adults. Scaling back Medicaid could be a particularly risky proposition for Arizona, according to the state program's administrators, because Arizona is already one of the most efficient, lean programs in the country. Getting locked in at the current funding rates would give other states a leg up, explains Tom Betlach, who runs Medicaid in Arizona. "If they are able to achieve improved outcomes and reduced costs, they are able to capture those savings," Betlach says. "Versus we actually get penalized for being a good steward of taxpayer funds." Betlach says Arizona needs more control than it currently has over who and what types of treatments and procedures are covered if the federal government intends to give Arizona only a fixed amount of cash. The current federal fight over health care puts the state's Republican governor, Doug Ducey, in a tricky situation. Ducey has said he would like the ACA repealed, but he has also said he doesn't want hundreds of thousands of people to lose coverage. He has expressed concern that the GOP bill doesn't give the state enough flexibility. And it wasn't even on Ducey's watch that Arizona expanded Medicaid. 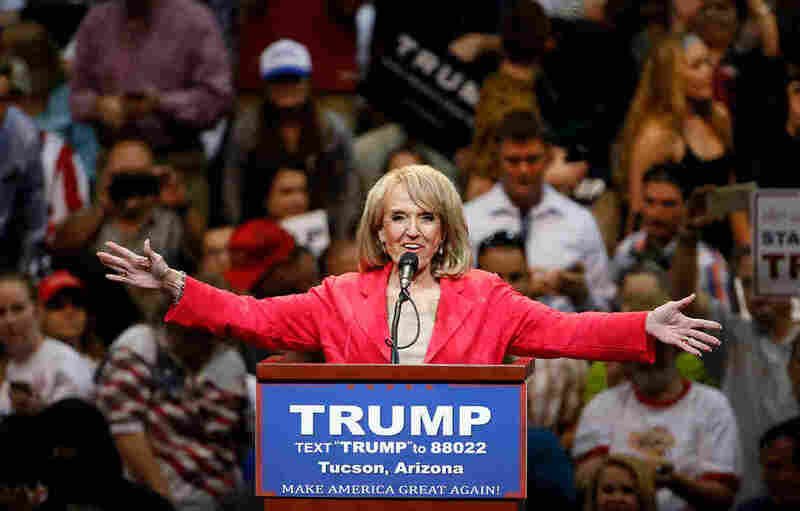 The expansion happened under Jan Brewer, Arizona's former governor and a Trump ally. To pull that off, Brewer had to band together with Democrats and buck some of her fellow Republicans in the state Legislature, who then sued her over the expansion. In their lawsuit, the legislators claimed that the way the state pays its share — a fee on hospitals — is unconstitutional. At a recent court hearing for that long-running lawsuit, Brewer defended her controversial decision to accept the ACA's expansion funding. "I think it was the right thing to do," she said in an interview outside the courtroom. "It saved lives. It insured more people. It brought money into the state. It kept rural hospitals from being closed down. And today there are tens of thousands of people that are very, very grateful." But some Republicans, like state Sen. Debbie Lesko, who was among the Arizona legislators who sued Brewer, figured the day would come when the feds would go back on their promise. "I voted against Medicaid expansion, not because I don't want people to get health coverage," Lesko says, "but because I'm a realist and I know how much we can afford in our budget." Dozens of states and their legislatures could soon be grappling with the same lean reality, as Republicans in Washington cinch the purse strings tight. This story is part of NPR's reporting partnership with Kaiser Health News and KJZZ. Will Stone is a senior field correspondent for KJZZ.